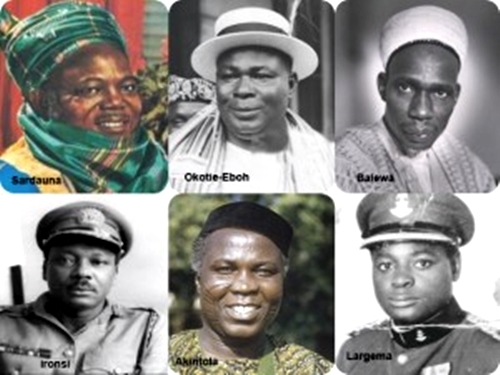 Observing the political intrugues playing out today and the accompanying misfeasance, one could see a repeat of the situation that necessitated the 1966 coup which, although having players from virtually all the ethnic groups in Nigeria and geared towards enthroning a Yoruba man, chief Obafemi Awolowo, was conspiratorially designated Igbo Coup. The unbridled desire of the Northern hegemony to keep hold on power and covinently dominate the rest, necessitated the revolutionary action of 1966. Obviously, the Fulani supposes Nigeria an inheritance of their forefather, Othman Danfodio, hence the insulting and egomaniac claim "we are born to rule." The political unrest Biafran officers attempted to quell in 1966 is today threatening to rear its ugly head fully. The Fulani, bent on having his evil way, wouldn't allow any Biafran close to any exalted military position. Justice Onnoghen's illegal suspension and replacement with a Fulani man elaborates the Fulani agenda for the country. Noise makers rose, pretending to defend democracy with vain words and empty threats. That, however, is expected of slaves. When their master gives order, they murmur but can't resist. So as has been the norm in this British evil creation, after these few days of noisemaking, Justice Onnoghen's saga will be forgotten. The power-drunk Fulani deciders tested the resolve of Nigerian citizens with the imposition of Jubril Aminu Al-Sudani - a washed-out Sudanese actor - on the people. Having observed the endemic myopia and mental ineptitude of the Nigerian, the Fulani stepped up their game. The tent pitchers - Yoruba people - should be ignored totally this time. Any attempt or suggestion to work with the Yorubas should be discouraged, for Yorubas, being a people without honour, breach agreements without a second thought. I’m talking about a people who are willing to deny their ancestry in order to stay alive. Biafrans took it upon themselves to salvage the Yoruba land through the 1966 revolutionary coup but got stabbed in the back. Yes, they got stabbed in the back by the same people they went to save. As if the treachery wasn't enough, the Yoruba spearheaded the starvation of millions of Bifaran children to death. Edited by Nelson Ofokar Yagazie.